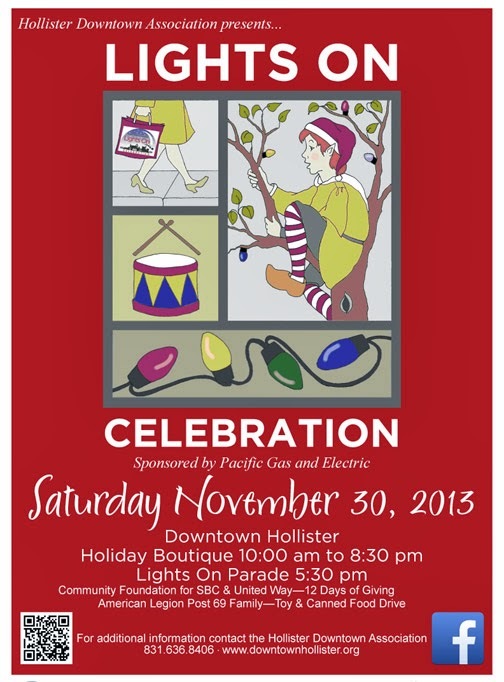 This Saturday, November 30, 2013, is the 23rd Annual Lights On Celebration, organized and hosted by the Hollister Downtown Association. It's an all day event, from 10 AM to 8:30 PM, which includes a Holiday Boutique, live entertainment, and the traditional Lights On parade. The year's theme for the parade is A Family Tradition. Beginning at 5:30 PM, the parade starts at the corner of San Benito and Haydon Streets and will end at Fifth and San Benito Streets. The review stand will be in front of the Veterans' Memorial Building. The Holiday Boutique at the Veterans' Memorial Building will feature about 56 vendors. Opening at 10 AM, the boutique will offer a wide variety of products, from foods to candles, soaps, purses, jewelry, plants, and unique local handcrafted items. 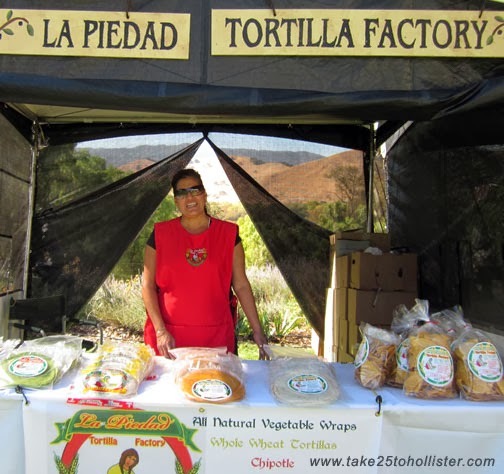 Some of the vendors will be Silpada Designs Jewelry, Vista Notes, M&M Plants, Origami Owl, Pampered Chef, Gaia's Cottage, Designs by Juli Ann, and East-West Fashion. 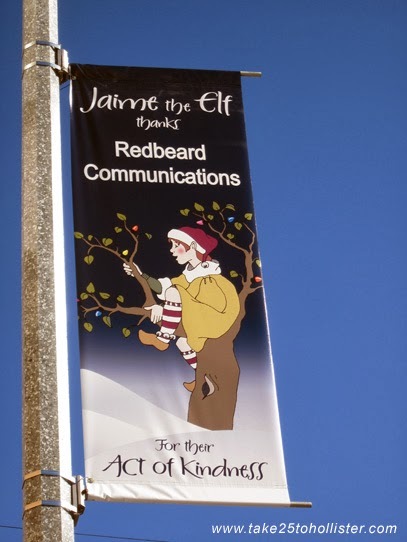 Local artist Kathleen Sheridan will be on hand to sell and sign her book, Jaime the Elf, the beloved character who Santa gave the task of lighting downtown Hollister. The American Legion Post 69 will accept donations of canned food and wrapped toys throughout the day in front of the Veterans' Memorial Building. 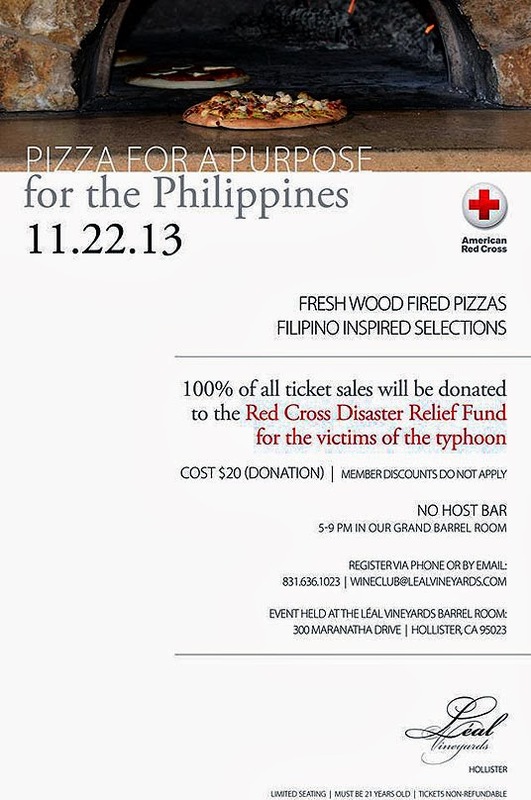 The donations will be distributed to families in need within our community. Post 69 will have coffee, hot chocolate, and cookies on hand to give to contributors. 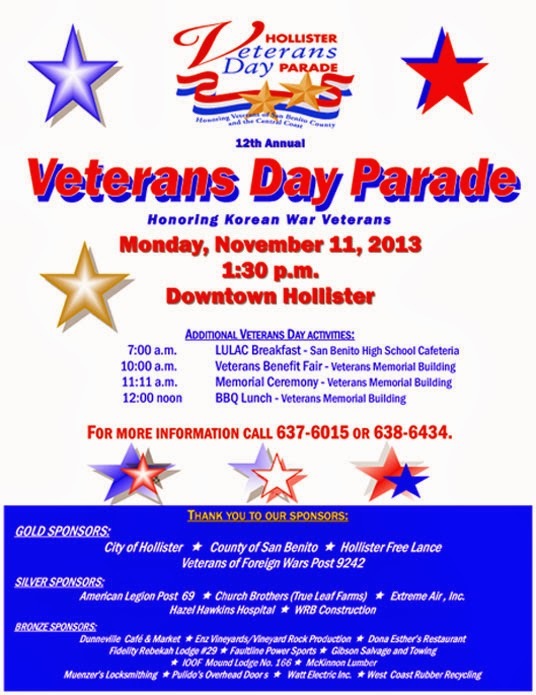 Several things are scheduled throughout the day at the Veterans' Memorial Building Plaza. If you miss any of the youth groups, then check them out at the Fifth Street Stage where they will repeat their performances. 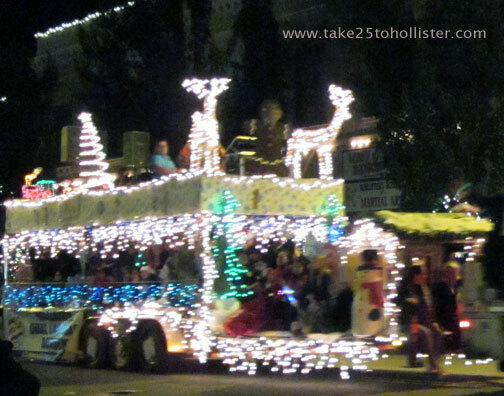 Head over to this page at the Hollister Downtown Association web site for more details about the Lights On Celebration. There, you can find a list of participating vendors at the Holiday Boutique, a map of the parade route, when and where you can have your kids take a photo with Santa and Mrs. Claus, and more. This past Saturday, the Husband and I had breakfast at Grillin & Chillin Downtown. I ordered the corn beef hash and the Husband decided on the blueberry pancake with a side order of 2 scrambled and 2 slices of bacon. "That's a better deal," he said, after seeing that it was only a couple of bucks more as opposed to twice that amount for a side order of 4 pieces of bacon. Yup. After we ordered, Chuck, co-owner of the Grillin and Chillin, came by to greet us. "What are you having?" he asked. We told him. He nodded, a big fat grin taking over his face. "Have you had our pancakes before?" "You're in for a treat," he said. Before heading for the counter, Chuck may have said something like "They're kind of big." A few seconds later, he called. 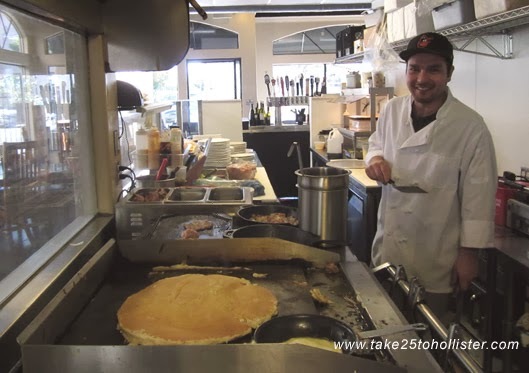 "The cook is making your pancake now. Come take a look." It turned out that wasn't the Husband's pancake. His was next. 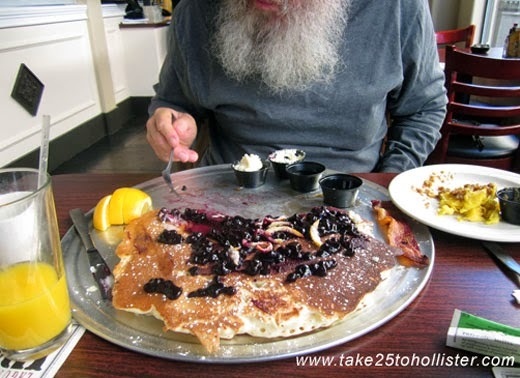 Let's just say when his blueberry pancake was set in front of him, we were both surprised. You ought to put a warning on your menu," we kidded the waitress. She laughed. "That's what the other customer said!" 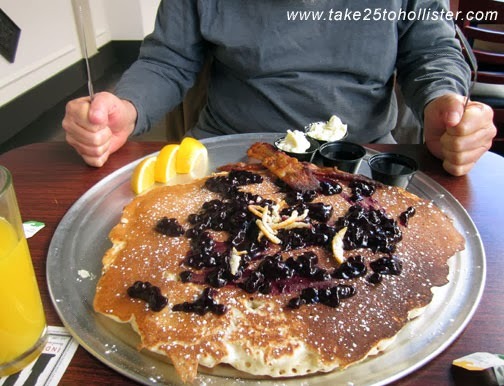 The Husband had an appetite that morning, so he put a good size dent on his yummilicious pancake. The waitresses were surprised. "Usually the adults don't eat as much," one waitress said. "The kids are a different story. Goes to show that the Husband is still a kid. Grillin & Chillin Downtown, at 650 San Benito Street (next to Brown Alley), is open for breakfast seven days a week. They also serve lunch throughout the week, as well as dinner on Friday and Saturday. Their winter hours are Sunday through Thursday, 8 AM to 3 PM, and Friday & Saturday, 8 AM to 8 PM. Of course, you can see the big, fantastic grin. Could it be smiling because of what it sees reflecting in the windows across the street? 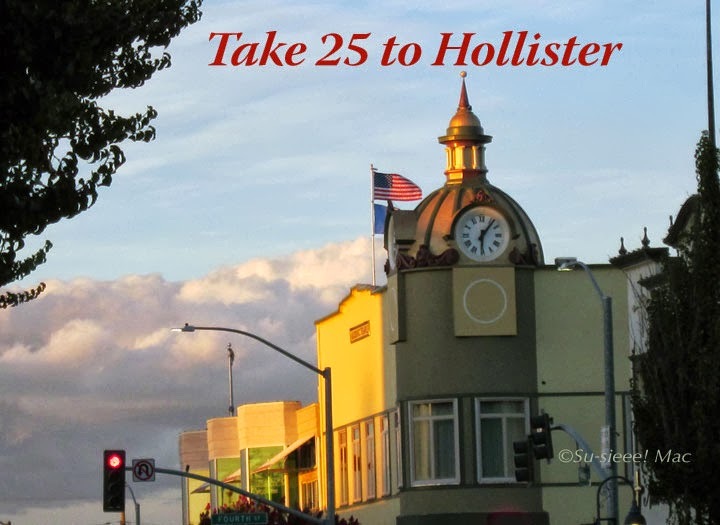 Ah, the things you might see as you wander down Monterey Street in downtown Hollister. 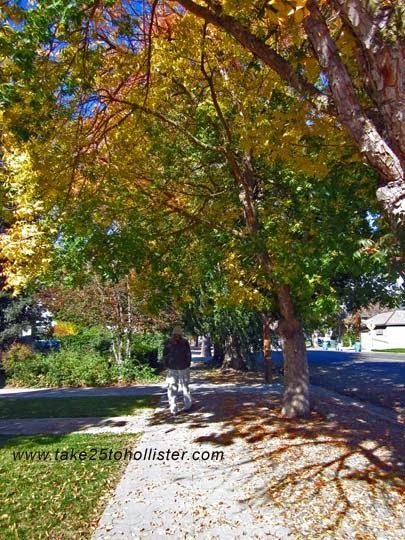 The rustle of leaves as the wind rushes through them. 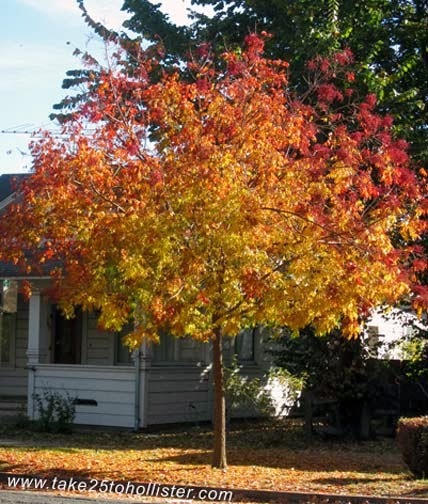 Colorful falling leaves. Fallen leaves. 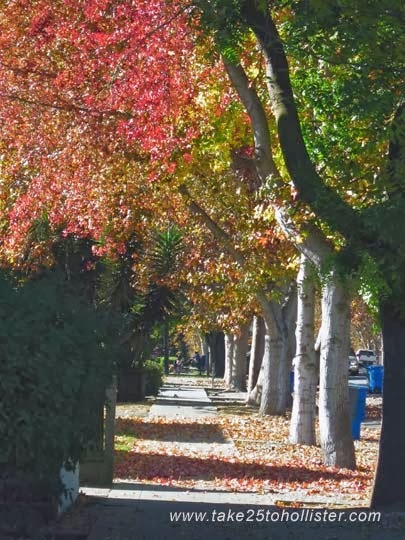 The cracking sound of dry leaves as we walk on them. Thank goodness, it's not that cold! 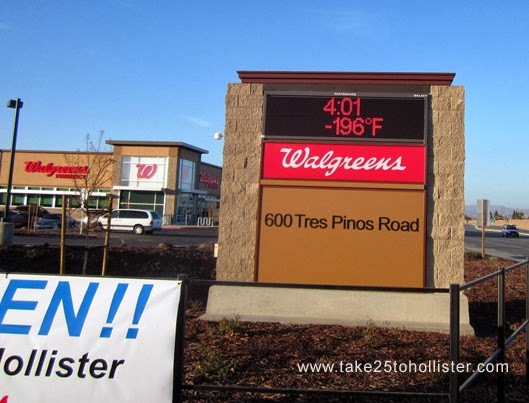 By the way, Walgreens is now open. 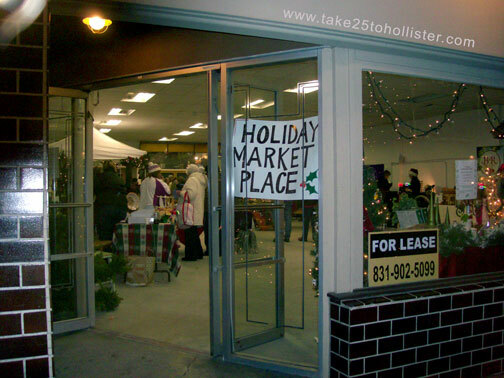 A couple of holiday crafts fairs have already come and gone. Here's what you can look forward to in the coming weeks. 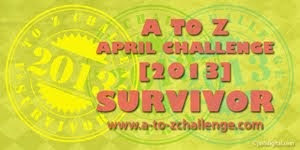 If you know about other events, please leave a comment. Note: Entry is a canned food donation for the Community Pantry. Note: Santa will arrive at noon. Note: Santa will arrive at 6 PM. Note: Sponsored by the San Benito County Arts Council. Note: One of the many activities at the 23rd Annual Lights On Celebration. Note: $6.50/per person for breakfast. Santa will be there. 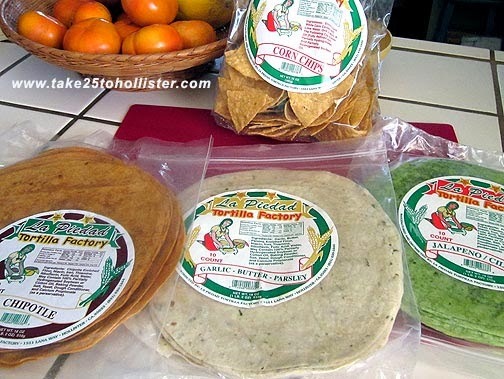 We have several Mexican bakeries in town. I like them all. 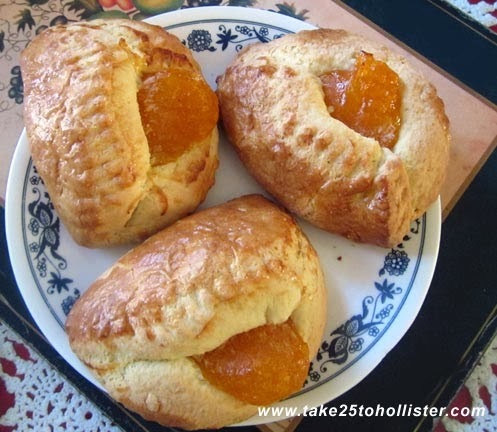 Lately, I've been favoring Conchita's Bakery on 730 San Benito Street whenever I have a yen for something sweet. What I like about Conchita's sweet stuff is that they aren't so sweet that I feel like my teeth are melting. The dentist should be happy about that. The savory offerings are very yummy, too. I also like the prices. Fifty cents for a sweet roll. $1.50 for a ham and jalapeño roll, which, by the way, is quite hardy. 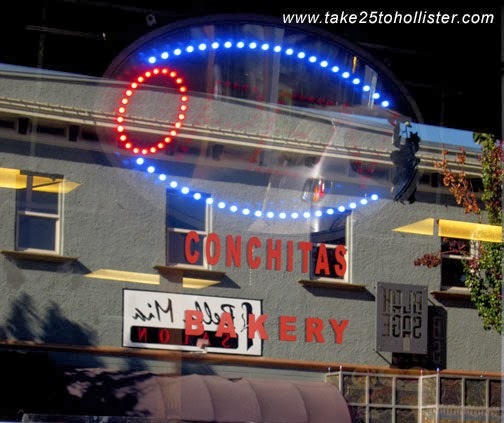 Conchita's Bakery is located in what was once the bagel place in the old Free Lance building. Still can't picture it? It's on the west side of San Benito Street, between South and Seventh Streets, across from the Blak Sage Gallery. 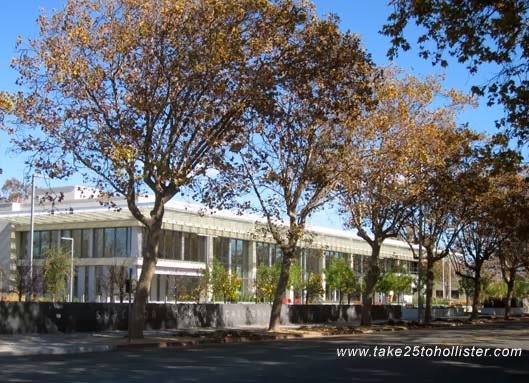 Did you know that the new courthouse under construction is the fifth one for San Benito County? Yeah, that's news to me, too. I thought the current courthouse was the second one, and the gorgeous structure modeled after a Roman palace was the first. The new courthouse is nearly finished. I like the landscaping and the red seats in front of the building. How about you? If you're interested in learning more about the construction, check out this page at the California Courts web site. 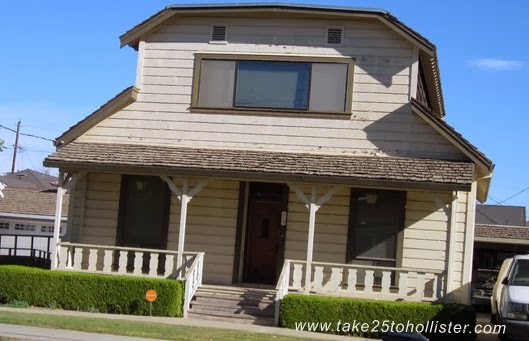 It already seems like it was long, long ago that Fremont School stood on the site of the new Superior Court of California in San Benito County, don't you think? 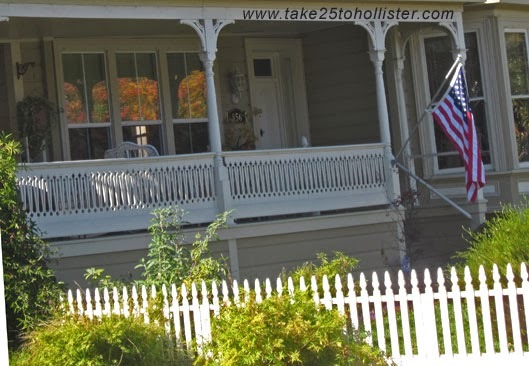 For that matter, once upon a time, the home of Col. William Welles Hollister, for whom our town was named, stood on that same spot. 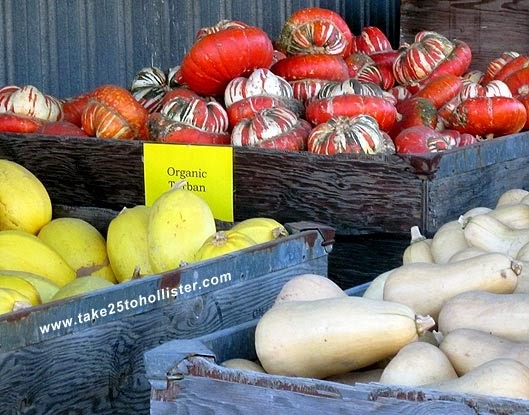 Boxes full of different organic squashes are available at The Farm—Bertuccio's Market.